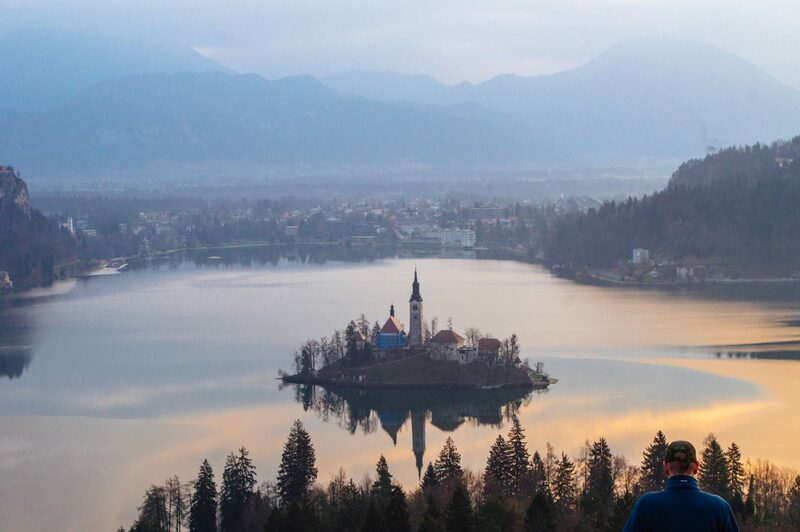 A lot of people will tell you that Slovenia’s Lake Bled is a piece of genuine fairytale magic. Sure, there’s the picturesque mountains, the cliff-top castle and the world’s favourite lone island, but a view that can pry a potato like me out of bed at 4am? Now that my friends, is a very special form of magic indeed. Seriously though, if it’s the best ‘value’ hike you’re looking for (e.g. best reward per amount of physical turmoil), then the Ojstrica hike is your best bet. While braving an additional 20 minute climb will bring you to the even higher Mala Osojnica, many prefer the view from Ojstrica, simply because it offers a closer view of the island and its surroundings. the guy who beat me to the punch! I recommend beginning the hike (from the trail head) about 30 minutes before the sun is expected to rise. The uphill climb only takes 20 minutes, although it’s quite steep, so be mindful of that. It’s not a super difficult climb, but definitely steep enough to be semi-challenging. You’ll be out of breath, but you’ll survive. I went in late March and the sun was coming up around 6:50am. We made it to the Ojstrica viewpoint around 7, and still had to wait a little while before we saw the actual sun. Keep in mind: the sun comes up behind some mountains before you can fully see it, so don’t panic if you can’t make it up for exactly sunrise time. Good walking shoes, a must because the dirt path is quite steep, and gets rocky near the end. A flashlight, because even though it’ll be sort of light enough to see, some extra light does help. Water, trust me you’ll need it! Snacks/breakfast, because you’ll want to stay up here a while to soak up the view. Maybe some orange juice & champagne for a proper mimosa morning? A camera, because the photo opps are irresistible. 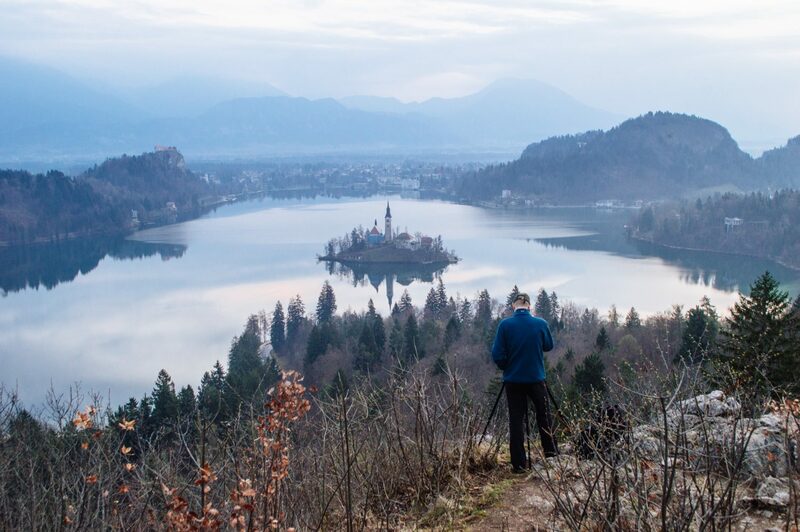 The easiest option would be to stay at Lake Bled (browse your choices here), or to drive. Depending on the time of year, there might also be buses that get you there early enough. Regardless, you’ll want to make sure you end up at the starting point marked on the map below sometime around 30 minutes prior to sunrise. If you are coming by car, there are plenty of parking lots around the lake. The one closest to the starting point of the trail is marked on the map below, right by Camping Bled. Parking here was free until 8am. I have to admit, spotting where to begin the hike can be tricky, so be sure to refer to the map below for a rough idea. From the parking lot, (facing the lake) you’ll want to turn right and then follow the foot path until the road begins to veer left. Look out for a big grass patch across the road and walk towards it. You should see a signpost with brown signs for “OJSTRICA” and “OSJONICA”. It’s pretty easy to miss, but check out these photos for a reference. If you hit the canoe rental place at any point, you’ve gone too far. Look out for this! When you see this, you should cross the road and get onto the grassy patch. Once you begin on the path, it’s a steep climb uphill, but rather straightforward. 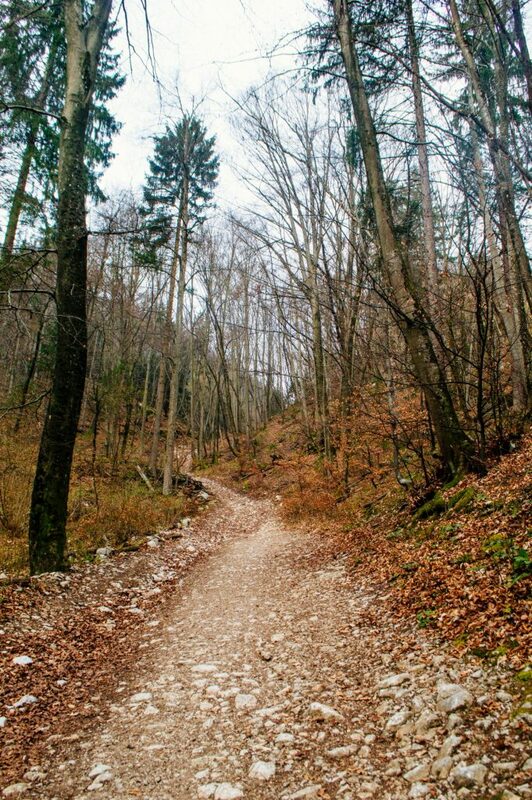 You’ll be walking on a dirt path surrounded by trees, but just follow the signs for Ojstrica and you’ll be fine. After 15 minutes or so, you’ll reach a rocky bit where you’ll do a series of switchbacks that bring you to the viewpoint. Be careful with your steps here! … and then get ready to soak in the beautiful view! Stubby legs attempting to not fall and die. 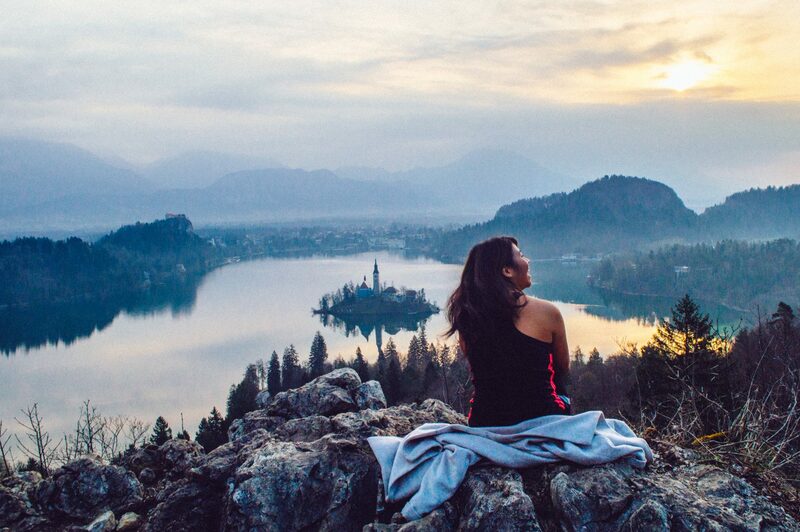 To make your Lake Bled sunrise trip a little bit smoother, here’s a map I created with all the important locations you need to know before your hike. Oh my goodness, that looks absolutely incredible! Definitely pinning this post for future me! it was GORGEOUS! 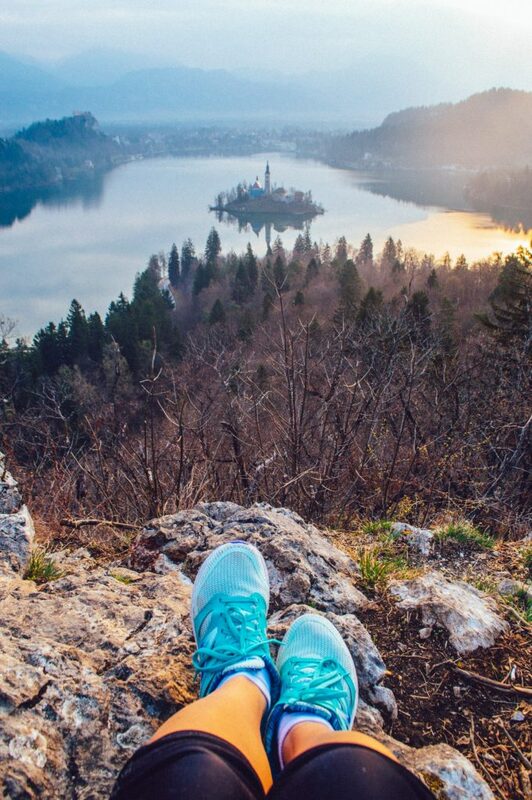 Definitely do it if you’re visiting Lake Bled. <3 Thanks for reading, Lisa! It looks like something right out of a movie, Christina! 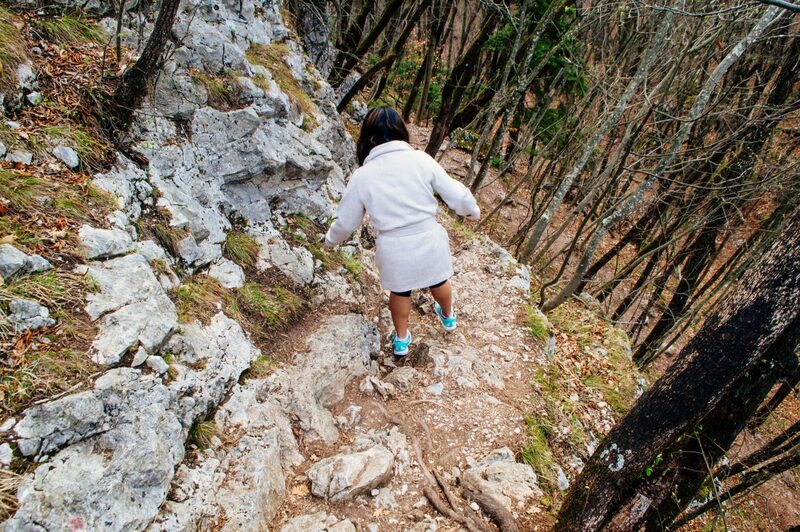 If I were more of a hiker, I’d do that too… I think I’d die if I did what you did at my fitness level right now, haha! Haha it really wasn’t TOO bad! Steep, but not a long hike. I think you’d be able to handle it 😉 It’s worth it for the views – that’s for sure. One of my dream destinations and I love to hike. And you took so many amazing pictures! 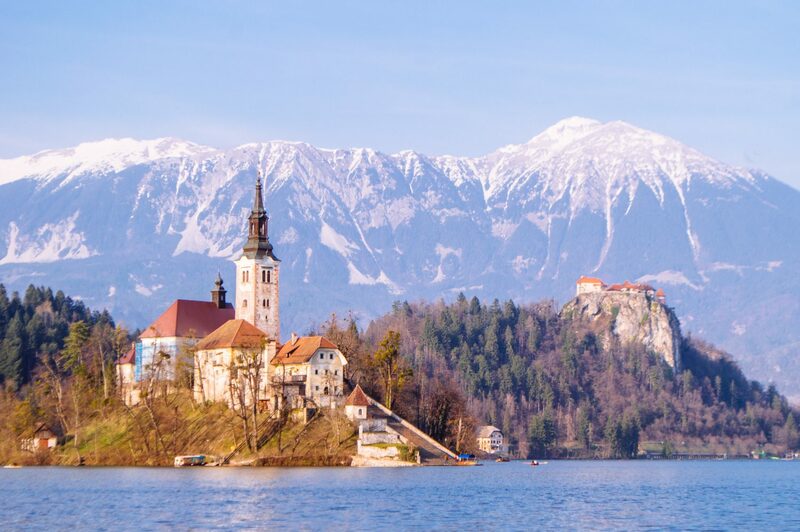 You would love Slovenia then – seriously! It’s gorgeous 🙂 I’m dying to head back and spend more time there. Thanks for reading, Neni! Thanks, Sara!! Yess I didn’t know what this exact hike was called either, but I had seen a lot of photos from this viewpoint so was determined to find it for myself 😉 so glad I did! So magical and dreamy! That’s definitely a rewarding view! right?? I’d do it again in a heartbeat. Thanks for reading, Therie! I did this hike. It was a bit steep (so I was a bit out of breath), but it was pretty doable. A good description of it! Just as an FYI, all signposts have been removed. Even on the trail. I hiked 20 minutes up the huge hill behind before realizing. Use GPS.